Pro tips for using Google Home's handy shortcut and automation feature. Unless you’ve dug deep into the settings menu for Google Home, you might not know about the smart speaker’s most powerful feature. It’s called Routines, and it allows you to execute multiple actions with a single voice command. For example, you can have Google Assistant announce the weather, a personalized traffic report, and news updates while you get ready for work, or have it dim your smart light bulbs and play some relaxing music a few minutes before bedtime. These routines even work with the Google Assistant app on iOS and Android—no smart speaker required. 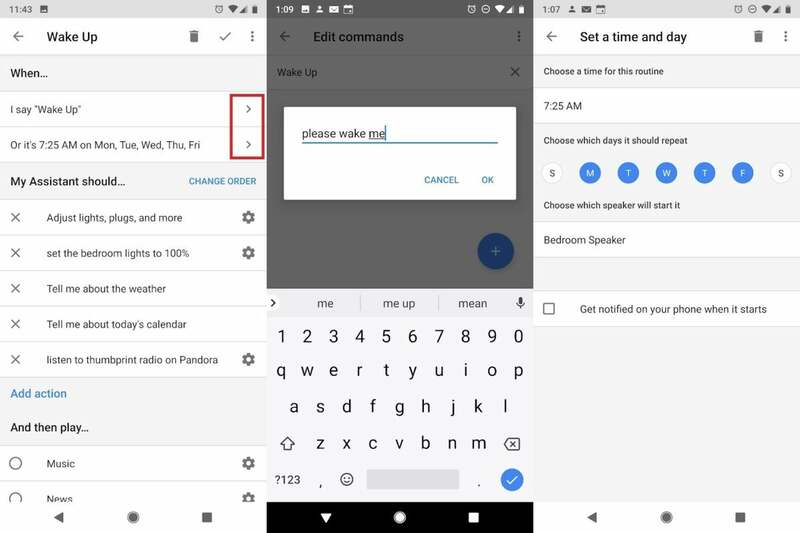 You can also schedule Routines to run at specific times without voice commands, effectively turning a Google Home speaker into a high-tech alarm clock that can wake you up with music, information, and smart home automations. Within this menu, you’ll see several ready-made Routines for things like leaving the house, commuting home, and going to bed. Tap on any of these Routines to modify them, or hit the + button to build a Routine from scratch. 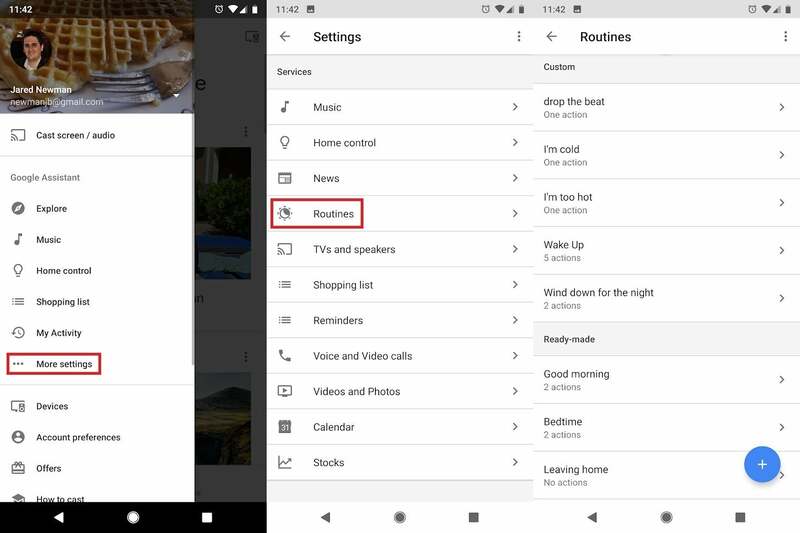 Each Routine must be triggerable by at least one voice command, and ready-made routines come with default commands that you can’t remove. The phrase “Let’s go to work,” for instance, is always associated with the “Commuting to work” Routine, and “Good night” is always associated with the bedtime Routine. You can, however, add more trigger phrases to each Routine. Under the “When” or “When I say...” section, tap the arrow key, then tap the + button on the next screen. Type in whatever trigger phrase you’d like to use, then hit “OK.” For custom Routines, you can also specify a day of the week and a time for the event to occur automatically. To change what actually happens when you utter a trigger phrase, look through the “My Assistant should...” section and check off any actions you want to perform. You can also tap the gear icon to modify those actions further. For instance, tapping the gear next to “Tell me about my commute to work” lets you specify a home and work address, and tapping the gear next to “Adjust lights, plugs, and more” lets you set up controls for any smart home devices you’ve connected to Google Home. Want to add an action that’s not on the list? Select “Add action” at the bottom, then type in whatever voice command you’d like Google Assistant to process. 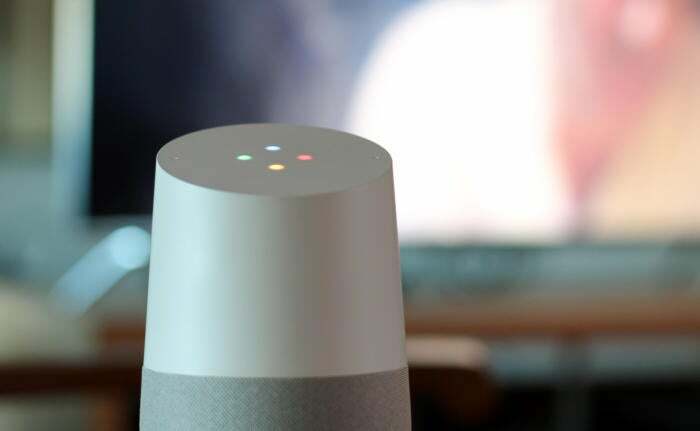 For example, you can get the score of your favorite sports team (“Tell me about [team name]” works best for this), ask for a motivational quote, broadcast a message to all Google Home speakers in the house, or start playing the news on a nearby Chromecast. Keep in mind that Google Assistant will execute routines in the order that they appear in the “My Assistant should...” section. To rearrange them, hit “Change Order” at the top of the list, then hold and drag an item to move it around. Finally, Google Assistant can cap off a routine with music, news, radio, a podcast, or an audiobook. Just select the type of audio you want, and hit the gear icon to fine-tune what plays. When you’re finished creating a Routine, make sure to hit the check mark in the top-right corner to save it. Use the “leaving home” Routine to check on your commute; play a podcast; and make sure the lights are off, doors are locked, and thermostat is turned down (or up) for the day. Create a “chill-out” Routine that throws a relaxing YouTube video onto the TV via Chromecast (such as an aquarium or a crackling fireplace), mutes the Chromecast, loads some relaxing music on the Google Home, and dims any nearby lights. Create a “workout” Routine that pumps some energizing music from the speaker and loads your favorite exercise video on YouTube via Chromecast. Build a “Help me focus” Routine that enables your Android phone’s Do Not Disturb mode and plays white noise on your office speaker. 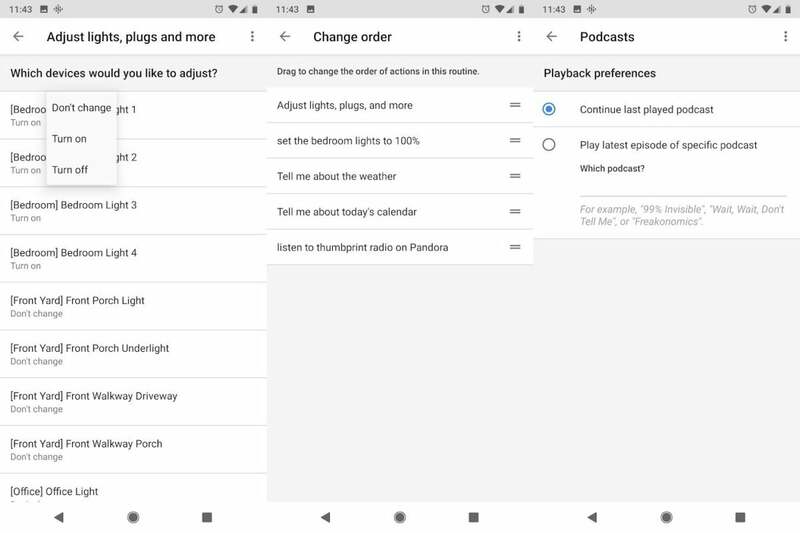 Issue: With music playback, for instance, the “And then play...” option only works with your default music service, and at least with Google Play Music, it’s unable to shuffle playlists. That means you’ll hear the same song every time during your morning or evening Routine. Workaround: To correct this baffling oversight, use the “Add action” feature to play music instead of the “And then play...” option. From here, you can have Google Assistant play music from any service and ask it to shuffle a playlist. Just make sure this action appears at the bottom of the order. Issue: Some smart home controls—such as dimming the lights to a specific percentage—aren’t available through Google’s ready-made routines. Workaround: Again, you’ll have to type in the command manually through the “Add action” feature. Issue: There’s no option to schedule ready-made Routines. Workaround: Annoying as it is, you’ll just have to create a new routine from scratch. After doing so, you’ll see a “Set a time and day” option under the “When...” section, where you can set up recurring events that trigger on a specific speaker. Issue: You can’t trigger Routines with motion sensors, location, or other contextual events. Workaround: Unfortunately, there’s no way around this limitation at the moment. But given that Amazon’s rival Alexa assistant can trigger Routines on Echo devices based on smart home events, hopefully it won’t be long before Google responds.